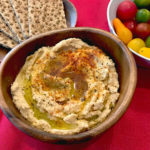 Prepare dried chickpeas: In a large pot, combine chickpeas, water, and baking soda, and bring to a boil over high heat. Reduce heat to medium and cook, uncovered, for about 2 hours, until chickpeas are soft. Drain chickpeas (keep 1/2 cup of the cooking water), season with salt and pepper, and set aside to cool. Transfer cooked or canned chickpeas, tahini, garlic, lemon juice, cumin and 1/2 cup of the cooking water to a food processor and puree. Adjust flavors with salt and pepper, and serve with olive oil.